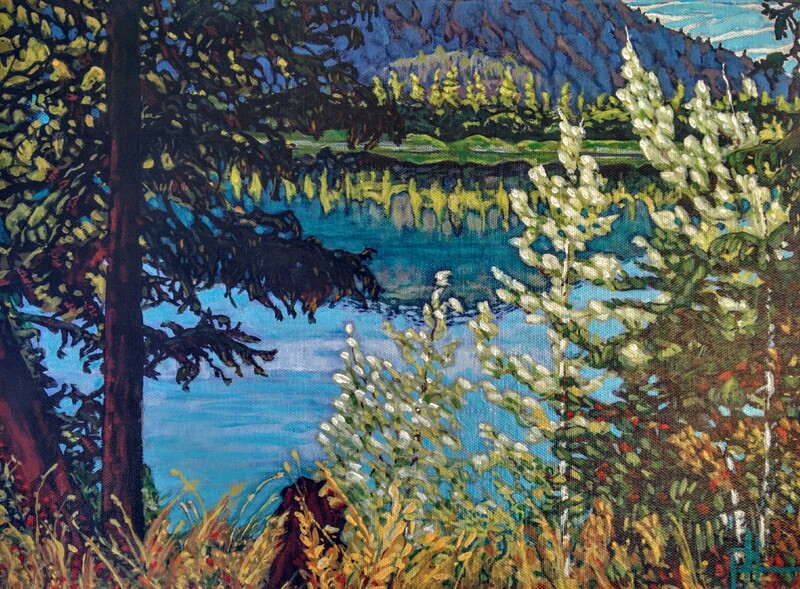 This painting is of Shannon Lake in West Kelowna – only a few minutes away from where our family lives. We would retreat there many evenings to fish, walk, and just enjoy the sunset. So it seems that kids in school + autumn = painting productivity. Those of you who have checked in with this blog over time have noticed that it sometimes takes me a donkey’s age to produce a new painting. This one was finished off for the most part in one week (with another week used to fuss over it unnecessarily/detrimentally). I am happy to report that I am developing a bit of a “shorthand” where the organization and brushstrokes are concerned. I have taken advice to use a bigger brush for the earlier stages and it helps move things along, keep it “fresher” (ie. less fussy) and think more about movement and mood of the subject instead of the tiny niggling details. Progress! Next Post cows in bonnets! All is well Tom! Arm is functional and kids are thriving! Hoping you are getting to enjoy the fall loveliness of Sheridan Lake! As usual, beautiful and inspiring. Not just the paintings, but your words. Thank you S.I.L! When you were last in Kelowna, were you there (Shannon Lake)? I love all of the color and the light in this one it is beautiful!